New approach has implications for the future of quantum information science. In a recent issue of Physical Review A, Argonne researchers reported a new method for alleviating the effects of ​“noise” in quantum information systems, a challenge scientists around the globe are working to meet in the race toward a new era of quantum technologies. The new method has implications for the future of quantum information science, including quantum computing and quantum sensing. Many current quantum information applications, such as carrying out an algorithm on a quantum computer, suffer from ​“decoherence” — a loss of information due to ​“noise,” which is inherent to quantum hardware. 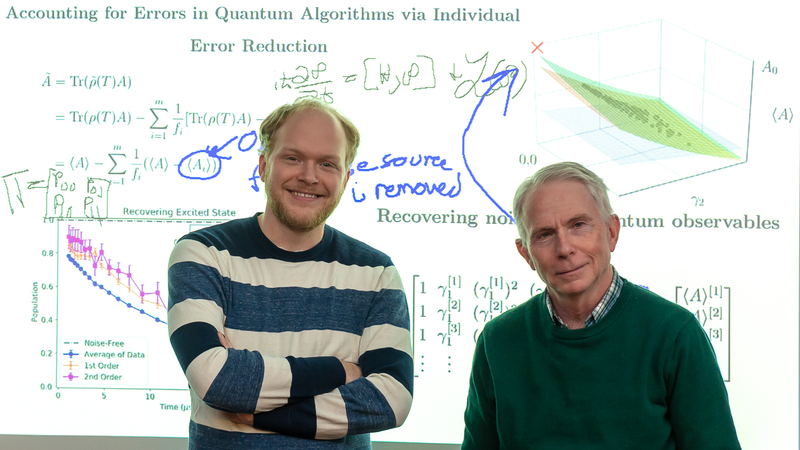 Matthew Otten, a Maria Goeppert Mayer Fellow at Argonne, and Stephen Gray, group leader of Theory and Modeling at the Center for Nanoscale Materials, a U.S. Department of Energy Office of Science User Facility, have developed a new technique that recovers this lost information by repeating the quantum process or experiment many times, with slightly different noise characteristics, and then analyzing the results. This research was performed at the Center for Nanoscale Materials, a U.S. Department of Energy User Facility at Argonne, and was supported by the U.S. Department of Energy, Office of Science. Bebop, a high-performance computing cluster operated by the Laboratory Computing Resource Center at Argonne, was used to perform simulations that helped hone the new method and demonstrate it in situations that are not currently available with quantum hardware.